As kitchen cleaning experts, we have spent many years learning the various types of kitchen cleaning techniques that make us better and faster workers than our competition. We work fast and get more done in an hour than other cleaners. When the time comes to clean your kitchen, you need to know how to go about it efficiently so you don’t waste valuable time you could have been spending on your business. Cleaning kitchens is not a herculean task, if you know how to approach it correctly. There are a variety of techniques when it comes to kitchen cleaning. We combine proper technique with the right cleaning supplies to get the job done quickly and efficiently. Here are a few tips that may help. APPLIANCES: You must know which cleaning supplies to use on the appliances in your kitchen. For example, stainless steel cleaning products should be used on your kitchen appliances for the most part, but not on your cabinets as they may damage the cabinet in terms of color, materials and so on. Appliances are best cleaned with soft sponges. COUNTERTOPS: Marble countertops, for example, you need to be very careful because it is a delicate stone that is easily chipped or stained. Once damaged, fixing a marble countertop is quite expensive to repair. We use a special light cleaning product for marble countertops and take great care in the cleaning process. REFRIGERATORS: Many home owners neglect the cleaning the refrigerator for weeks at a time. This results in bad odors and often times permanent stains. Additionally, there are health risks that come with a dirty refrigerator. Be sure to wash down the exterior surface with the help of a warm soap, soaked in lukewarm water. Ensure that you are cleaning the exterior surface with a soft cloth, especially in the case of stainless steel refrigerators. CABINETS: For wood cabinets, consider using a wood cleaner and remove any grease or dirt. Be sure to read the instructions on the cover of any wood cleaning product to comply with all the instructions carefully. Next, get a dry and a soft cloth and wipe the cabinet thoroughly. A good quality wood polish is also very helpful. An orange oil is a great option as it leaves behind a great fragrance of citrus fruits throughout your kitchen. After you are done, rub the cabinet with a soft cloth so that the oil can blend well with the surface. Wood cabinets can be a bit tricky and you need to keep on wiping till the time the oil completely blends with the cabinet surface. As stated earlier, cleaning kitchens is not a very difficult task if you know the right way to approach it. You must know the materials to use and use the properly. Equally important, and perhaps more importantly, you must know which materials to avoid. This is critical because if you happen to use wrong materials, they may have the potential to damage the kitchen permanently. When you buy the kitchen cleaning supplies, it is wise to stick to the branded and the established cleaners as they are good in terms of quality. Every kitchen is different and we approach each cleaning as if it was our own kitchen. We always make sure that we use the right cleaning chemicals for each kitchen. I really enjoyed reading this article. I liked what you said about marble countertops, indeed, you need to be very careful…especially with those really expensive, delicate marble counters that can cost a fortune. For me cleaning a kitchen is a difficult task, Some cleaning materials ruin the color and some materials leave a stain if over used. 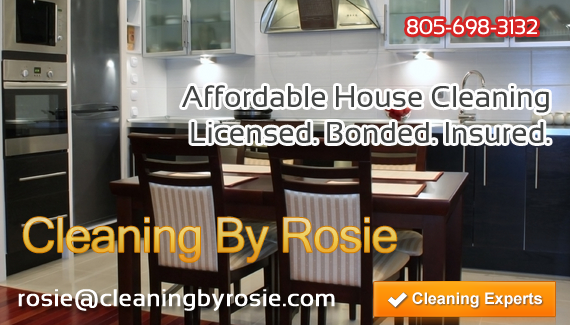 Thank goodness Rosie is here to help people take good care of their kitchen.